The World Rowing Federation (FISA) has awarded the 2018 World Rowing Coastal Championships to Sidney, BC. The regatta will take place October 11-13, 2018. A new rowing society – OARCA Coastal Rowing – has been formed in BC for the purpose of hosting this event. The Organizing Committee is heavily supported by individuals from Vancouver Island, but also draws interest and expertise from across the country. Organizing Committee members include past Olympians and other long-time rowing enthusiasts from BC, AB, MB, QB, and PEI. We had a chance to connect with Race Director, Brenda Taylor, to hear her perspectives on what bringing this event to BC will mean. What was your first experience with coastal rowing? Why did you want the World Rowing Coastal Championships here in BC? What were some challenges your faced during the bid process? Now is the perfect time to get involved in coastal rowing. In the lead up to the 2018 World Rowing Coastal Championships, a variety of opportunities will be available to try coastal rowing for the first time, or fit in some training in the coastal shells before signing up to race. The Victoria City Rowing Club (Victoria) and Salish Sea Coastal Rowing Club (Vancouver) have boats already available for anyone interested in testing out coastal rowing. These boats can also be borrowed and used on other waterways. 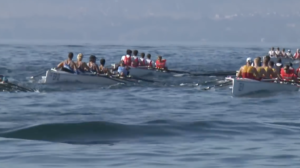 A series of Come and Try Coastal Rowing Events are being planned for the Summer across BC. All BC rowers are encouraged to consider racing at the World Rowing Coastal Championships. Rental boats will be available for competitors. To assist with race preparation, OARCA Coastal Rowing will be trying to set up some Come and Try Events at the race venue which will allow an opportunity to test out the equipment on the actual course before race day. The event website www.wrcc2018.com is live if you’re curious to learn more. Our challenge to you, BC – get out there and try coastal rowing! 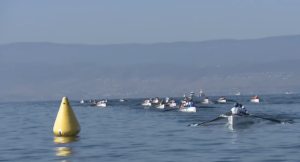 Take a sneak peak below at what this type of rowing looks like on race day.